I'm still learning the ins and outs of Instagram and the whole picture cropping thing is making me minor-ly mental. Until I upgrade my phone I think I am stuck with whatever I can get for any image captured while out on the hunt. This is the Dinky Toys "Scout Car" I found it in a great hiding place for toys - a box of old toy trains. I remember that while I played with one type of toy, I would often introduce other kinds of toys in the mix. I think I used to call it imagination. I don't know what the kids call it today. If these were my trains I would have expected to see a number of crippled plastic soldiers as well, but when I saw this Dinky Toy, I remembered what playtime in the basement was like...INCOMING!!!! KAPOW!! BAM!! CRASH!! KABOOM!!! Dinky toys were a British manufacturer's product with a long history and great detail that collectors look for today. If you see one of them don't keep walking - pick it up and appreciate the detail and the potential value. Even in this condition the Scout Car is worth about $10 dollars more that I paid for it ($1.00). The Homestead Inn started out as a large home just off New Milford’s famous green built in 1852 by John Prime Treadwell. After serving three generations of Treadwells it changed hands twice to become the property of Mary Philpot in 1928. Mary converted the home into The Homestead Inn and ran it until 1977! For many years it was considered the leading hotel in the area. 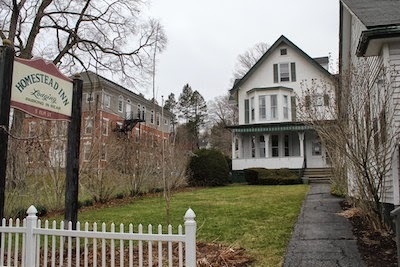 The Homestead Inn did well as a stopping off point for visitors of patients at the New Milford Hospital across the street, and parents of students of the prestigious private school - Canterbury - on the hill above the Inn, as well as the occasional traveling salesman. The Inn was also useful to sightseers exploring the picturesque Housatonic region. It was a diminutive mainstay of the area. 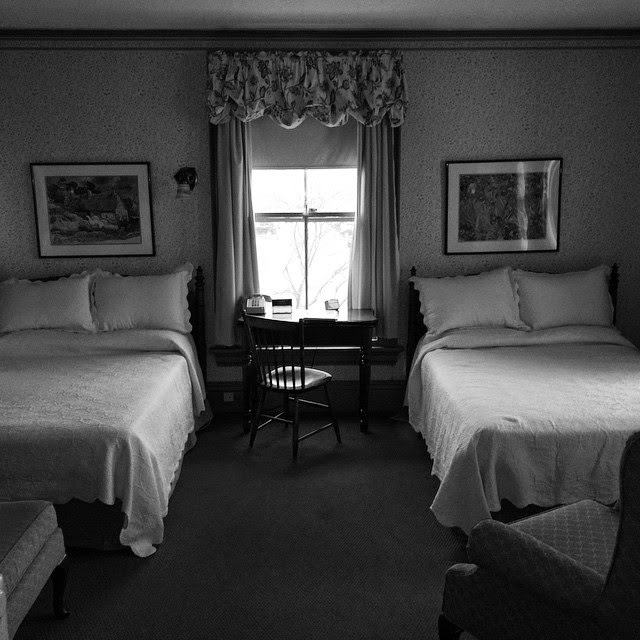 Changing owners in 1977, the Inn keep rolling along modernizing and maintaining while still keeping the charm of an old New England home. The large front room and dining area abounded with huge double hung windows and gave visitors the opportunity to lounge and read or walk around the longest green in Connecticut. The Inn changed hands two more times landing in the care of Bill and Sherry Greenman in 2003. Unfortunately, these would be the last owners to run the Homestead Inn. In 2014, Bill Greenman passed away and though Sherry continued on, it was recently announced that the family would close the Homestead Inn. The Inn is now closed for good and much of the contents will be sold. The estate sale, run by Just In Antiques and More, is schedule for the last weekend in April and if you want to walk through an historic Inn that saw guests like Joseph and Ethel Kennedy (there to see John gradate from the Canterbury School), Marilyn Monroe, Vladimir Horowitz, Leopold Stowkowski, Frederick March and many more, this is your last chance. Maybe someone will step in at the last moment and save this icon of a simpler life and that a picturesque town like New Milford can be home to the Homestead Inn once again. A quick instagram video of a cool toy captured at a recent dig. The interesting part is that this is a large piece and is not a train car. I know there were many large accessories that were made for adding realism to a layout - like mountains and buildings. I felt this represented at time when toys could allay the fears of youngsters when the spectre of nuclear annihilation was new and frightening. Ancient Chinese Secret: If you have seen Yuan - you have not seen them all. 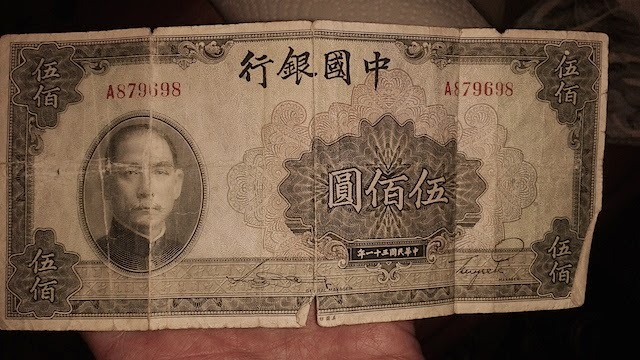 So what is a 500 yuan note from 1942 worth? Found at a Danbury estate sale run by my friend Justin of Just In Antiques and More.